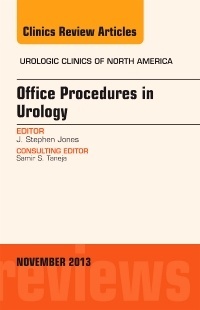 This issue of the Urologic Clinics covers office-based procedures in urology. There are a wealth of urologic procedures that can be done in the office setting, offering reduced risks to the patient, less stress, and better recovery time, as well as a more favourable reimbursement for the physician. Articles include more common issues such as stone management, ultrasound/prostate biopsy, and vasectomy, as well as infusion therapy, biofeedback, and office anesthesia.